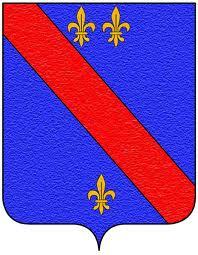 Eldest known ancestor Marchese Ranieri Bourbon is mentioned between 1014 and 1027 and had possessions in Tuscany. His descendant Marchese Ugolino Bourbon (+ before 1364), podesta of Siena, was confirmed by the Emperor as Marchese di Monte Santa Maria on 14-5-1355. His descendant Pietro Francesco Bourbon del Monte (1784-187.) was created Principe di San Faustino on 6-8-1861. As he died childless he was succeeded by his nephew. 65. Virginia dei Conti Guglielmi-Baleani * …; Dr van Guglielmo Conte G.-B. 89. Lydia Paine * ... + 10-12-1834; Dr van David P.
91. Lucretia Webb * Windham, Mass. 8-5-1775 + Akron, Ohio 16-1-1843; Dr van Captain Nathaniel W.